A Colorful Solution in High Quality Hand Protection. 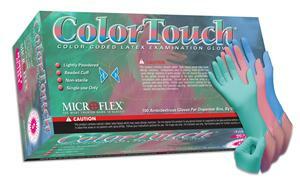 ColorTouch® is a refreshing change from ordinary latex gloves with its peppermint scent, and bright, size-specific colors. Made from premium latex, ColorTouch® goes on easily and wears comfortably. Fully textured for a secure grip in wet and dry conditions.